Revenge. At first, it seemed simple to Liam Oswald. When he was only six years old, he witnessed the brutal murders of his mother and father. So Liam had dedicated his life to finding his parents' killers and bringing them to justice. After all, he was the son of Willem Oswald, the Grandmaster of Ontavia's paladins, and Naya Oswald, a Master Paladin herself. Surely, Liam, too, was bound to become a great paladin, perhaps even the next Grandmaster. Then he would be powerful enough to hunt down the Red Paladins that had killed his parents. Then he would be powerful enough to have what he deserved. Revenge. But when Liam goes undercover as Ozwell Stahl, he quickly learns that nothing is that simple in Ontavia. Attacked from within and without by decadence and darkness, the nation desperately needs good people to steer it back on course. Liam must decide if he can give up his personal need for vengeance and, instead,  join those who seek justice for everyone in Ontavia. Revenge. Somehow it no longer seemed simple. Welcome to the life of the paladin! 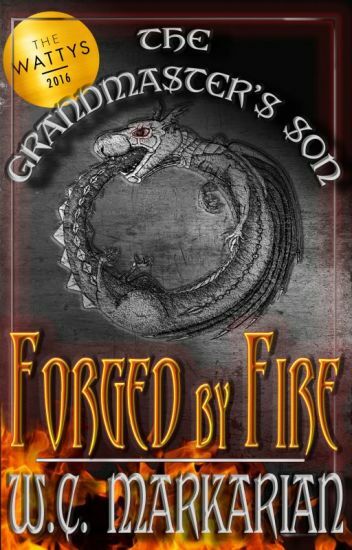 "Forged by Fire" is the first novel in my epic illustrated fantasy adventure called "The Grandmaster's Son." This is a work of love for my children and for the many children, young adults, and adults I am blessed to have as part of my life. Please let me know what you think about the story, the writing, and the illustrations (starting with the cover) as I add them. Your votes and comments mean a great deal to me. A weekly(ish) journal updating readers on the progress of THE GRANDMASTER'S SON. Hopefully, questions about updates, publishing progress, and merchandise(?) will be answered here. Basically, just a way to let readers know what I'm working on and to get feedback on some of my wilder ideas. When Laidu, a half-human, half-dragon Ranger, rescues a mysterious girl from slavers, he doesn't know it but he's in for a world of trouble. Teaming up with an insane scholar, a chatty assassin, and two mercenaries, they go to take the girl -Kyra- home. But as they begin to journey onward, they are pursued by a relentless, unkillable monster, hellbent on ending Kyra's life. And Laidu is hearing voices in his head, voices beckoning him to join them in madness, to give in to the dragon within. In this world of old magic and ancient struggles, the Wheel of Time meets Skyrim in a tale of courage, love, heroism, and atonement where old kings rise and immortals die. Set twelve years after the events in 'Snow Dancer,' the courage of the Yukimusha lives on in Iro Kasumi,  the eldest daughter of Iro Hiroki. She yearns for the same great adventures her father once had - and even greater ones of her own. When a number of ruthless abductions invokes terror throughout Yukura, Kasumi and Tae, her white tiger, soon discover that the real threat is much closer to them than they had presumed. An unexpected - and unwanted - stranger offers his reluctant assistance, but can a girl and her tiger put their trust in him before time runs out? Thank you to everyone who loved the story! Reeling from a devastating loss Jake McCall takes refuge in the Texas hill country hoping to find peace. Tranquility however, is the last thing that fate has in store for him. Caught up in a violent storm Jake finds himself a castaway in another world where social classes are set in stone and powerful dragon lords use their riders to enforce their will. Out of the frying pan into the fire, Jake finds himself in the center of a whole new storm as he becomes the guardian of newly born twin dragons. Holing up in the wilds he vows to protect his new charges but by riding them, he has broken an old taboo, a privilege that the high nobles of this world jealously guard and a situation that Jake cannot stand. As he clashes with his new world, a group of dragon rider cadets is sent to investigate, one of whom hides a dangerous secret of their own. Wyena is the proud daughter of a noble house of riders but as she is female she is barred from riding. Informed that she has had her hand arranged in marriage she rebels and attends academy in her cousin's place. But jealousy runs hot amidst the riders and as tensions rise, she may have to protect more than just her pride. An outcast rogue must break a curse put on his fate, or die on his nineteenth birthday. To survive, he'll need the sword of a maiden, the aid of an immortal, and the power of forbidden magic that could cost him the only girl he ever loved. *** THE JACK OF SOULS won a Silver IPPY this year! I wrote this out of pure love of trickster rogues; I love the wit over brawn motif -- Odysseus over Achilles, Raven over Eagle -- so I like to play with it in my stories. In JOS I set the rogue and con-artist Harric against a foil of warriors in a land threatened by magic and civil war. Whenever possible I turn familiar tropes on their heads: instead of a handsome young Lancelot, I cast a broken-down ex-champion addicted to pain-killing herbs; instead of a dashing Squire Brian, the old knight reluctantly takes an ambitious young woman as squire. Similarly, I re-imagine the standard medieval milieu by infusing aspects of two of my favorite historical periods, Elizabethan England, and The American Frontier. Both eras boast a kind of nationalistic arrogance that borders on hubris, and a magnificent spirit of resourcefulness and re-invention that is fun to play with. The Jack of Souls is first in a series. I am posting parts of the sequel here now (The Knave of Souls), to help me refine the story. 30-year-old Jo Minjoon has always wanted to become a chef. He started his culinary career late in life, however, and is currently chopping onions at a restaurant. Regretting his life choices, he wishes he could go back to change it all and falls asleep. Meanwhile, someone out there is willing to give him another chance and send him back in time. How will he use the new powers he obtained from this mysterious being? Hayden, a young boy with the dream to be a dragon rider, tries to help keep the world safe from the evils that have hunted him down since he was a small child. He quickly realizes that he is on the wrong side of the war an has no idea what to do next. The battle is over. Now it's war. Valerie's entire life has been spent fighting for survival. But now, the stakes have never been higher, and her enemies have never been more powerful. The Fractus have proven that they won't hesitate to kill those who stand in their way, including the people Valerie loves. And their path of destruction is growing-on Earth and the Globe. With Reaper always one step ahead, Valerie must find a way to change the game, or risk never catching up to an enemy with the conviction and power to upset the delicate balance that protects those without magic from being exploited. As the Fractus grow in number and strength, can Valerie convince enough Conjurors to fight by her side against a menace that could upend the universe? In the third novel of The Conjurors Series, Valerie has the life she's always dreamed of-a family, a budding romance, and powerful magic that she is finally learning to harness. She also has an enemy determined to rip it all away from her. After humiliating the mighty dragon lord Rindar Earth castaway Jake McCall and former noble lady Wyena Dieron find themselves on the run. Pitting themselves and the dragons they ride against the world at large, the pair find themselves dodging pursuit at every turn as they struggle to retrieve and decrypt an ancient chronicle vital to finding the next step on the path before them. Jake's wild antics have served him well in the past, but a dangerous new enemy has entered the fray and Jake will have to call upon every trick in his arsenal to make sure that this dangerous pursuit doesn't cost the both him and Wyena their lives. Note: The first book in the series needs to be read in order for this one to make sense. Enjoy! Oz dreamed of becoming a paladin so he could avenge his parents' murders. But now that he's had a taste of the paladin's life, he is filled with uncertainty. The Warrior's Way comes with a heavy price and has already cost him dearly. The path Oz once thought was crystal clear is now muddied with doubt and despair. Elsewhere, the Malamagus presses forward with his diabolical plan. Trouble lurks outside Ontavia's gates, preparing to deal Oz's homeland a terrible blow. Welcome to "Cursed by Fire" the second novel in "The Grandmaster's Son." Prepare yourself for new friends, new enemies, and new challenges. Then strap yourself in for a wild ride across Ontavia and beyond as Ozwell Stahl struggles with his destiny as well as the magic raging inside him.